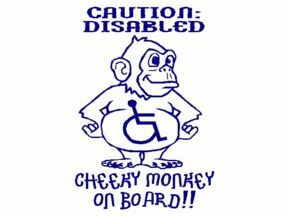 Car Sticker - Caution Disabled. Cheeky Monkey On Board! Caution Disabled. Cheeky Monkey On Board!! My little one likes the cheeky monkey. This is great, it is hard to find a disabled sticker which is fun and for children, I love it! I have stuck it on the window next to my son's car seat so that if we were involved in an accident, the emergency services would be aware we have a child with a disability. I cannot thank you enough, this is perfect!